Your first task in Phase One: Vehicle in Motion is to observe the vehicle in operation to note any initial cues of a possible DWI violation. At this point you must decide whether there is sufficient cause to stop the vehicle, either to conduct further investigation to determine if the suspect may be impaired, or for another traffic violation. You are not committed to arresting the suspect for DWI based on this initial observation, but rather should concentrate on gathering all relevant evidence that may suggest impairment. Your second task during phase one is to observe the manner in which the suspect responds to your signal to stop, and to note any additional evidence of a DWl violation. "Evidence of drinking" or drugs in vehicle. If this initial observation discloses vehicle maneuvers or human behaviors that may be associated with impairment, you may develop an initial suspicion of DWI. The next page presents common symptoms of alcohol influence. This unit focuses on alcohol impairment because research currently provides more information about the effects of alcohol on driving than it does about the effects of other drugs on driving. Remember that whether the driver is impaired, the law enforcement detection process is the same, and the offense is still DWI. The common effects of alcohol on the driver's mental and physical faculties lead to predictable driving violations and vehicle operating characteristics. The National Highway Traffic Safety Administration (NHTSA) sponsored research to identify the most common and reliable initial indicators of DWI. This research identified 24 cues, each with an associated high probability that the driver exhibiting the cue is impaired. These cues and their associated probabilities are described in the following Special Section, Initial Visual DWI Detection Cues. They also are discussed in Visual Detection of Driving While Intoxicated, a film sponsored by NHTSA to assist law enforcement officers to recognize DWI detection cues. This film is included in the training videotape. Following are 24 cues which police officers may use to detect nighttime impaired drivers. The cues were developed from a list of more than 100 driving cues that have been found to predict BACs of O.OS percent or greater. Hundreds of law enforcement officers were involved in three field studies involving more than 12,000 enforcement stops. These cues represent the most systematically developed method available for visually predicting whether a vehicle operated at night is being driven by a DWI driver or a sober driver. Weaving - Weaving occurs when the vehicle alternately moves toward one side of the roadway and then the other, creating a zig-zag course. The pattern of lateral movement is relatively regular as one steering correction is closely followed by another. Weaving Across Lane Lines - Extreme cases of weaving when the vehicle wheels cross the lane lines before correction is made. Straddling A Lane Line - The vehicle is moving straight ahead with the center or lane marker between the left-hand and right-hand wheels. Swerving - A swerve is an abrupt turn away from a generally straight course. Swerving might occur directly after a period of drifting when the driver discovers the approach of traffic in an oncoming lane or discovers that the vehicle is going off the road; swerving might also occur as an abrupt turn is executed to return the vehicle to the traffic lane. In the illustration below, a swerve was executed to return to a lane after a period of drifting toward opposing traffic. Turning With Wide Radius - During a turn, the radius defined by the distance between the turning vehicle and the center of the turn in greater than normal. The vehicle may drive wide in a curve. Drifting - Drifting is a straight-line movement of the vehicle at a slight angle to the roadway. As the driver approaches a marker or boundary (lane marker, center line, edge of the roadway), the direction of drift might change. As shown in the illustration, the vehicle drifts across the lane marker into another lane, then the driver makes a correction and the vehicle drifts back across the lane marker. Drifting might be observed within a single lane, across lanes, across the center line, onto the shoulder, and from lane to lane. Almost Striking Object or Vehicle - The observed vehicle almost strikes a stationary object or another moving vehicle. Examples include: passing abnormally close to a sign, wall, building, or other object; passing abnormally close to another moving vehicle; and causing another vehicle to maneuver to avoid collision. Stopping Problems (too far, too short, too jerky) - Stopping too far from a curb or at an inappropriate angle. Stopping too short or beyond limit line at an intersection. Stopping with a jerking motion or abruptly. Accelerating or Decelerating Rapidly - This cue encompasses any acceleration or deceleration that is significantly more rapid than that required by the traffic conditions. Rapid acceleration might be accompanied by breaking traction; rapid deceleration might be accompanied by an abrupt stop. Also a vehicle might alternately accelerate and decelerate rapidly. Varying Speed - Alternating between speeding up and slowing down. Slow Speed (10 m.p.h. + Under Limit) - The observed vehicle is being driving at a speed that is more than 10 MPH below the speed limit. Driving In Opposing Lanes or Wrong Way On One-Way Street - The vehicle is observed heading into opposing or crossing traffic under one or more of the following circumstances: driving in the opposing lane; backing into traffic; failing to yield the right-of-way; driving the wrong way on a one-way street. The last circumstance is illustrated below. Slow Response to Traffic Signals - The observed vehicle exhibits a longer than normal response to a change in traffic signaL For example, the driver remains stopped at the intersection for an abnormally long period of time after the traffic signal has turned green. Slow Or Failure To Respond To Officer's Signals - Driver is unusually slow to respond to an officer's lights, siren or hand signals. Stopping in Lane for No Apparent Reason - The critical element in this cue is that there is no observable justification for the vehicle to stop in the traffic lane; the stop is not caused by traffic conditions, traffic signals, an emergency situation, or related circumstances. Impaired drivers might stop in the lane when their capability to interpret information and make decisions becomes impaired. As a consequence, stopping in lane for no apparent reason is likely to occur at intersections or other decision points. Driving Without Headlights At Night - The observed vehicle is being driven with both headlights off during a period of the day when the use of headlights is required. Failure to Signal or Signal Inconsistent with Action - A number of possibilities exist for the driver's signaling to be inconsistent with the associated driving actions. This cue occurs when inconsistencies such as the following are observed: failing to signal a turn or lane change; signaling opposite to the turn or lane change executed; signaling constantly with no accompanying driving action; and driving with four-way hazard flashers on. Following Too Closely - The vehicle is observed following another vehicle while not maintaining the legal minimum separation. Improper Or Unsafe Lane Change - Driver taking risks or endangering others. Driver is frequently or abruptly changing lanes without regard to other motorists. Illegal or Improper Turn (too fast, jerky, sharp, etc.) - The driver executes any turn that is abnormally abrupt or illegal. Specific examples include: turning with excessive speed; turning sharply from the wrong lane; making a U illegally; turning from outside a designated turn lane. Driving on Other Than Designated Roadway - The vehicle is observed being driven on other than the roadway designated for traffic movement. Examples include driving: at the edge of the roadway, on the shoulder, off the roadway entirely, and straight through turn-only lanes or areas. Stopping Inappropriately In Response To Officer - The observed vehicle stops at an inappropriate location or under inappropriate conditions, other than in the traffic lane. Examples include stopping: in a prohibited zone; at a crosswalk; far short of an intersection; on a walkway; across lanes; for a green traffic signal; for a flashing yellow traffic signal; abruptly as if startled; or in an illegal,.dangerous manner. Inappropriate Or Unusual Behavior (throwing objects, arguing, etc.) - Throwing objects from the vehicle, drinking in the vehicle, urinating at roadside, arguing without cause, other disorderly actions. Ask for Visual Detection of DWI Motorists. (DOT HS 808 677). NHTSA has also developed research identifying driving impairment cues for motorcyclists (ANACAPA Sciences, DOT HS 807839, 1993). making decisions (whether to stop, turn, speed up,slow down). Safe driving demands the ability to divide attention among these various tasks. "Divided attention" simply means the ability to concentrate on two or more things at the same time. Under the influence of alcohol and/or other drugs, a driver's ability to divide attention is impaired. As a result, the impaired driver tends to concentrate on only the most important or critical parts of driving and to disregard the less important parts, often creating unexpected or dangerous situations for other drivers. Two examples were particularly evident in the videotape segment Visual Detection of Driving While Intoxicated. In one instance the driver signaled for left turn, but actually turned right. In the other, the driver stopped for a green light. In each case the driver was unable to divide attention. The first driver was concentrating on steering, looking for the street where he wished to turn and slowing for the turn. The driver realized that a signal was required and actually operated the signal lever. But the driver didn't have enough attention left to move the lever in the right direction. Therefore he signaled left, but turned right. The second driver was concentrating on controlling the car's speed and direction. He noticed the traffic light, but he did not have enough attention left to react to the specific color of the light. Therefore he stopped for a green light. Some of the most significant evidence from all three phases of DWI detection can be related directly to the effects of alcohol and/or other drugs on divided attention ability. We will return to the concept of divided attention in Session VI. Personal Contact and Session VII. Pre-arrest Screening. the ability to describe that evidence clearly and convincingly. It is not enough that you observe and recognize.symptoms of impaired driving. You also must be able to describe what happened so that others will have a clear mental picture of what took place. Improving your ability to recognize and clearly describe observational evidence requires practice. Your second task during Phase One of the detection process is to observe the manner in which the driver responds to your signal to stop, and to note any additional evidence of a DWI violation. striking the curb or another object. Some of these cues are exhibited because the stop command places additional demands on the driver's ability to divide attention. The signal to stop creates a new situation with which the driver must cope. Flashing emergency lights or a siren demand and divert the driver's attention, requiring that the driver now divide attention between driving and responding to the stop command. Stopping itself requires the driver simultaneously to turn the steering wheel, put on the brakes, use a turn signal, and so on. 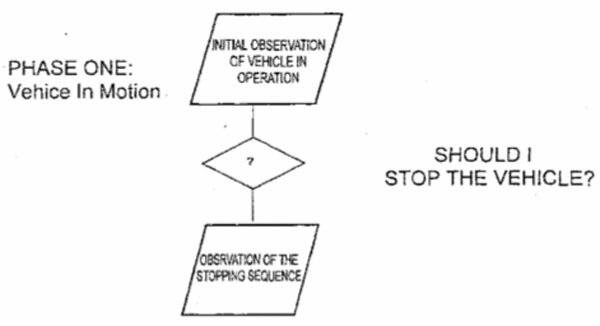 Thus the driver's task becomes more complex when the stop command is given. An impaired driver may not be able to handle this more complex task and additional evidence of impairment may appear. Recognizing and describing the reinforcing cues of DWI that appear during the stopping sequence requires practice.